So You Think You Can Mom? : Party Central: Flying High at Sky Zone Trampoline Park in Van Nuys! I recently celebrated my 39th birthday at Sky Zone Trampoline Park in Van Nuys, CA. I've been to a few different indoor trampoline parks and I have got to say that this location is, by far, MY FAVORITE!!! Upon entry, the first thing that we noticed was the cool, fresh air blowing throughout the entire facility. That means no funky, musty, stuffy, stinky, foot jam odor smacking you in the face! I was instantly impressed. My entire family was instantly impressed. I was greeted as soon as I walked in and before I knew it we were being checked in for our party. Our coordinator, Jason, immediately took all of our shoes, purses and jackets and assured us that they would all be waiting for us in our private party room. The best part about checking in at Sky Zone was their super comfy orange Sky Socks. Every jumper must be wearing a pair of Sky Socks in order to enjoy the facility. That's why is doesn't stink in here! Everybody is wearing brand new, clean socks. No stinky dirty bare feet or week old "lucky" socks. Thank you Sky Zone! Once we were all checked in, it was time to take flight. The layout of the Van Nuys location is off the charts. There is so much to do. Literally, an area for everyone. A basketball area called Sky Slam. A massive foam pit called Foam Zone. Multiple dodge ball courts which was the instant hit with our group. There's even a toddler area which is closed off and perfect for the little ones. I've never seen that at any other indoor trampoline park. After our 1 hour of air-time had passed, our group moved upstairs to the private party room for pizza, drinks and cake. Sky Zone had quite a few different areas available for the dining portion of your party. A few rooms were private and they also had open areas overlooking the trampoline park. There is definitely a space to fit any size group. The kids and adults had a great time munching on pizza and cake. I would have to say that my favorite part of the party was seeing my name written in chalk outside of our private room! 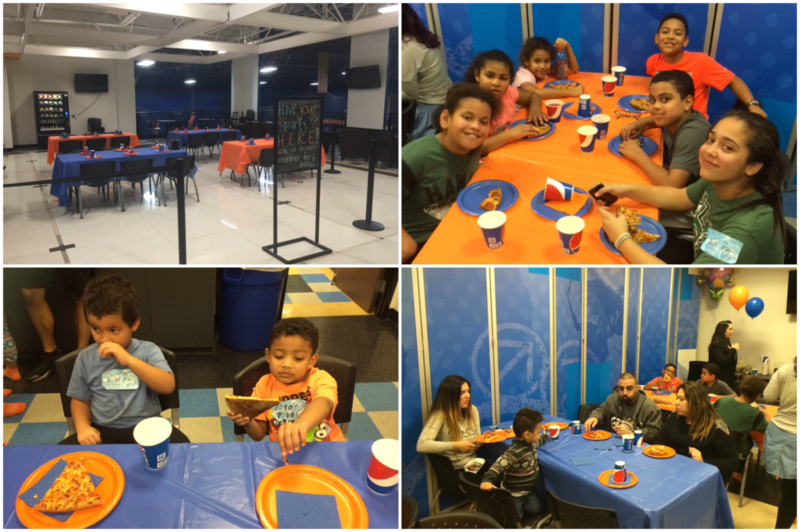 We all had such a great time celebrating at Sky Zone in Van Nuys. The time had finally come to say goodbye to our friends so our awesome party coordinator brought all of our shoes and personal belongings right to us before we headed downstairs to part ways. I highly recommend this location for your future group events and parties. The staff is so professional and happy. The facility is clean and spacious. The food was great and the memories will last a lifetime. 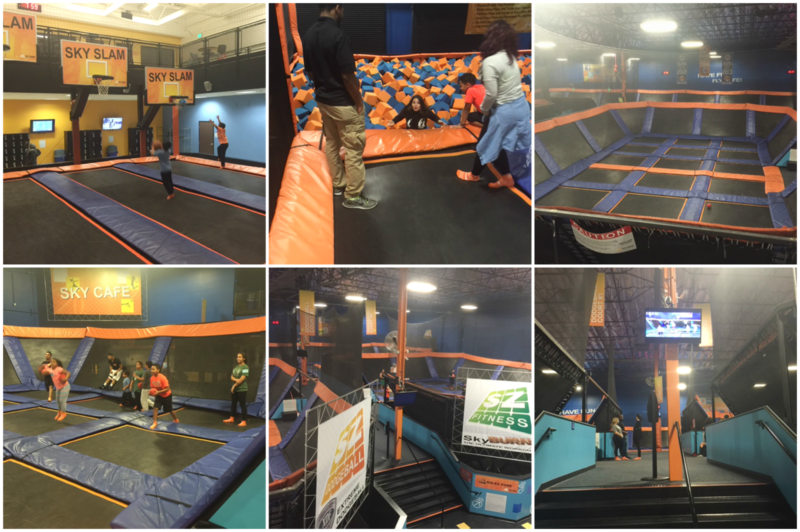 Thank You to our friends at Sky Zone Van Nuys. We will definitely see you real soon! Disclosure: I was not compensated for this post. I was invited to celebrate to my 39th birthday at this location in order to facilitate my review. These are just my two cents! The best apart from worthwhile write-up. That i popular the thing. Thank you just for making herein with us. Support carrying up-to-date a lot more. I will to receive for instance for the best benefit pertaining to reviewing around during Stars Zone appeared to be its ultra at ease citrus Stars Socks. Any jumper needs to be dressed in some of Stars Socks so that they can have fun with the option. The best quality a part approximately reading for located at Stones Region was first most of the tremendously fluffy orange colored Stones Socks. Just about every single jumper must remain making use of established Stones Socks to watch the unit. These are the absolute most essential indications and tips I can offer to help you have a superior time climbing. Some are talked about on different pages of the site, while others . Seems like the best gift you can really give to your kids is quality time. SkyZone is a great way to do just that. Seems like good fun for everyone. Amenities are complete and adequate for good family fun.